Home / Stock Picks / Stocks to Buy / Tesla Stock Soars on ‘Historic’ Quarterly Earnings — But Should You Buy? Tesla Stock Soars on ‘Historic’ Quarterly Earnings — But Should You Buy? 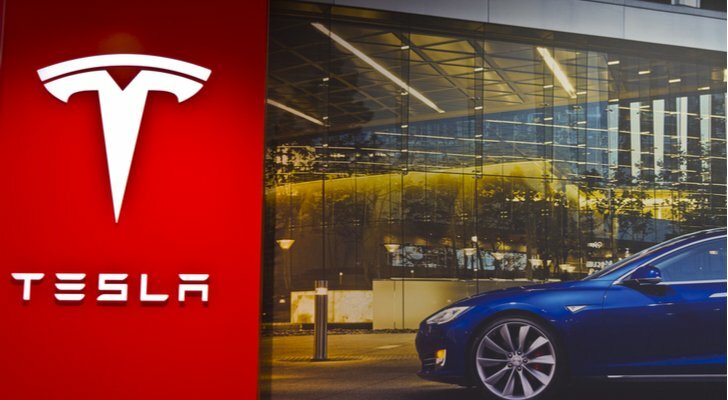 On Tuesday, Tesla (NASDAQ:TSLA) shares got a boost from an unexpected source — notable short-seller Andrew Left of Citron Research. Left said he has turned “long” Tesla stock because he thinks the company is “destroying the competition.” On the news, TSLA spiked nearly 13%. In after-hours trading Thursday, Tesla stock shot up another 13% to $327.50 due to better-than-expected earnings, which CEO Elon Musk announced earlier than originally planned. Might as well get the good news out quicker, right? Definitely. In the third quarter, Tesla Inc reported a profit of $311.5 million, or $1.75 per share, compared to the Street consensus for a loss of 99 cents a share. On an adjusted basis, the profit was a $3.02 per share and the forecast was a loss of 5 cents. Keep in mind that this was only the third time in its history that the company has posted a profit. Free cash flows were also robust, too, at $881 million. Tesla also posted an additional $731 million in total cash over the same period a year ago. In all, Elon Musk & Co. now have $3 billion in the bank. No doubt, key to strong quarter was the nice jump on the top line. Note that revenues came in at $6.82 billion, up from $2.98 billion on a year-over-year basis. The analysts’ were looking for $6.1 billion. Despite all the challenges with the production of the Model 3, it does look like Tesla is getting things into gear. At the end of the quarter, the company was producing over 5,300 units. In early August, CEO Elon Musk went to his Twitter (NYSE:TWTR) account and sent out a message that he had secured funding to buy out TSLA. It certainly stirred a substantial amount of trading. But, of course, the deal did not happen and the Securities and Exchange Commission (SEC) filed a lawsuit. Musk would go on to quickly settle, paying $20 million (Tesla would also pay $20 million) and agreed to step down as the chairman. There was also a requirement to bring on two independent board members. Interestingly enough, Citron Research remains a party to a shareholder suit regarding the matter. In mid-October, Musk indicated he would buy $20 million in TSLA stock. Consider that he currently owns about 20% of the shares, making him the biggest holder. Tesla continued to see departures of executives, including the Chief Accounting Officer (he had been on the job for only one month). During that past two years, more than 50 executives have left the company. While on the podcast called “The Joe Rogan Experience,” Musk gave a wide-ranging interview that lasted over two hours. It also appeared that he was smoking marijuana. In light of this, it’s probably no coincident that Musk’s buyout offer for Tesla stock was $420 a share. The quarter was definitely impressive. It also looks like Tesla will not have to seek more financing, at least during the next few quarters. Even with the distractions — such as with the SEC — Musk was somehow able to find ways to fix the tough problems with the manufacturing platform. Let’s face it, there was quite a bit of skepticism on Wall Street. Then again, it seems that Musk thrives on intense pressure. But this does not mean there will not be more volatility. For the most part, Tesla is still in the early stages of the Model 3 cycle. However, this quarter should buy Musk more time and keep Tesla stock bulls encouraged about the company’s prospects. Article printed from InvestorPlace Media, https://investorplace.com/2018/10/tesla-stock-soars-on-historic-quarterly-earnings-but-should-you-buy/.